Senate President Stephen Sweeney says we need to begin making the big fixes to New Jersey’s state finances now, because the problem will only get more expensive if we don’t. In an op-ed published by the Asbury Park Press, Sweeney points out that there are answers. He created the Economic and Fiscal Policy Workgroup made up of economists, academics, accountants and public finance experts last year, which put together a comprehensive report to tackle the structural deficits in the state’s public employee pension and benefits systems. 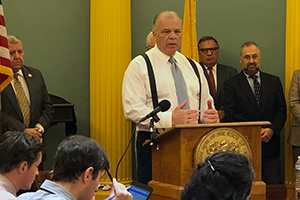 “Now it is up to all of us — as legislators, citizens, taxpayers, business executives and union leaders — to make sure that its balanced, common-sense solutions are implemented before the hole gets any deeper,” Sweeney writes. As the state prepares for debate of the FY 2020 budget, Sweeney points out that on its current path, New Jersey will face a $2 billion deficit in FY 2021 just to cover the ongoing costs of pensions, benefits and normal inflationary budget growth. That deficit will grow to $2.8 billion the year after that and $4 billion in fiscal year 2023, he says. Sweeney has pledged not to raise taxes this year, but as an example of how big the deficit will become, he points out that an across-the-board 25 percent income tax increase would be needed to cover it in FY 2023, if nothing else is done. Very interesting how the exact same politicians who not only created the structural deficits of the state’s public employee pension and benefits program are also IN the state’s public employee pension and benefits programs. Therefore, as I see it, they have no incentive to fix the unsustainable programs. He even already addressed this fact by stating the obvious, a 25% tax increase in 2023. Put it in the books. I might be a believer if he addresses the systemic “screwing” of the taxpayers by even righting just the language in the contracts that created some of this mess. For example, state employees collecting two pensions, two salaries and paid unused sick and vacation leave just to name a few. The foxes should not be guarding the hen house. As we all know, additional taxation is not the answer. We already have the highest taxes in the nation. We must reduce the cost of government. There is no other alternative.